I enjoy working with weddings in the more temperate months as much as anyone. So much variety and color to play with, so many happy blooming flowers, and so very lush. Chefs can choose from fresh garden produce, guests can relax outdoors, and photographers can rely on natural backdrops and late golden hours. The possibilities are endless. 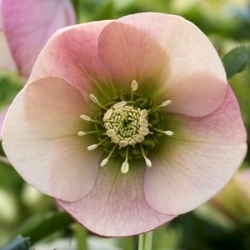 Delicate and graceful, hellebores are a winter wonder. At first glance, I understand the hesitation to think of it as a wedding season, but a closer look reveals rich and beautiful offerings for celebrations of love. Here is why Juniper Blue loves winter weddings. 1. Coziness feels like Love. The feeling of cozy is one like no other. Coziness is especially available in the winter months and reminds me so much of love--they are like cousins that grow up playing together and can finish each others thoughts and sentences. It is hard to tell when one ends and the other begins, as coziness constantly works to inspire extra special moments, intimate indoor spaces and a plethora of warm and fragrant baked goods, all in the name of love. 2. Natural Beauty, Winter Style. Stark contrasts and pale neutral backdrops come naturally when creating winter floralscapes. Bare branches reaching up are paired with delicate nodding hellebores and winter ferns; bright red, blue, and pink berries get tucked in with muted shades of juniper and cedar, fragrant and steady. The outdoor backdrop comes in gorgeous neutral shades of black, blue, white, grey and taupe. I think it is absolutely beautiful. The cold, quickly darkening days are perfect for firelight. Outdoor bonfires that draw people into a mesmerized circle, clasping cups of cider and swapping stories, the flicker and glow of candles illuminating a tablescape, or the crackle and snap of burning wood sending fragrant smoke through a stone chimney. Fire draws people together and saturates the senses. There is no time like winter for fire. 4. Indoor Spaces and the Magic Within. I love bringing the outside in, especially in winter. What initially appears a barren landscape is actually filled with sensual, fragrant treasure. Feathery evergreens, brightly colored berries, seed pods, bay leaf and winter roses grace tables and archways, transforming indoor space from blanck canvas to compositions of Winter Earth. To fill an indoor space with flowers and foliage in the dead of winter is to bring wonder and magic into a room, reminding everone that even in the coldest day, there is life and love and celebrations. With every approaching season, I relish the flora that comes in turn. Winter is no exception. There is truly so much to look forward to. ©2019 Juniper Blue Studio. All Rights Reserved.